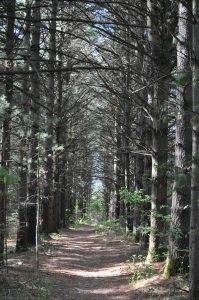 The Ganaraska Forest is an outstanding outdoor recreation venue. With hundreds of kilometers of trails, the Ganaraska Forest provides opportunities for a variety of activities, including hiking, horseback riding, mountain biking, cross-country skiing, snowshoeing and nature appreciation. The Central Forest lands are reserved for passive recreation, while hunting and motorized activities are permitted in the West and East Forests. All Ganaraska Forest users must obtain a day pass or membership. All memberships and day passes, including those for motorized-use, are restricted to Ganaraska Forest property, and do not allow use on municipal roads. The Highway Traffic Act and Off-Road Vehicle Act prohibits use of off-road vehicles on municipal roads. Please note that all off-road vehicles using the Ganaraska Forest must be plated and insured, and the operator must carry proof of insurance, as well as registration for the off-road vehicle (ownership) while riding. Please review the boundaries for all areas, as shown on the Ganaraska Forest maps. Ganaraska Region Conservation Authority, 2216 County Road 28, Municipality of Port Hope - 905-885-8173.